Salutations! The Yellow Ajah welcomes you to our Headquarters! In the world of Robert Jordan, the Yellow Ajah was dedicated to Healing through the use of the One Power. 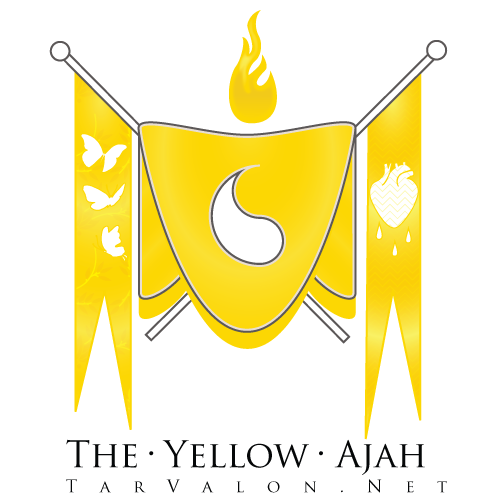 Here on TarValon.net we are also dedicated to healing, although in different ways. Our paths to that dedication are as myriad as the women that make up this cozy and eclectic group. Our passionate nature allows us to include all who visit with us - guests, Aspirants, as well as our Gaidin. As Yellow is a Healing Ajah, we have among us those trained in actual medical professions and those involved in alternative and complementary medicine. However, the healing and nurturing part goes beyond that, and so we have a good number of people that are the rock in the storm and the shoulder to lean on for many. "Being of the Yellow isn't about skill, child," Suana said. "It's about passion. If you love to make things well, to fix that which is broken, there would be a purpose for you here." Being a Yellow is about being a compassionate heart, ready and willing to be there for one another. We are dedicated to raising the hearts of others through our individual talents, skills, presence and love. For many of us, being Yellow isn't just about healing. It's about having the passion to change things, to fix things that you can see are broken, and about standing by the Ajah even when you feel alone inside it, because there will always be someone there to lend a hand.